We were delighted to provide the Wedding flowers at Callow Hall, Derbyshire for the summer wedding of Emma and Will in July. 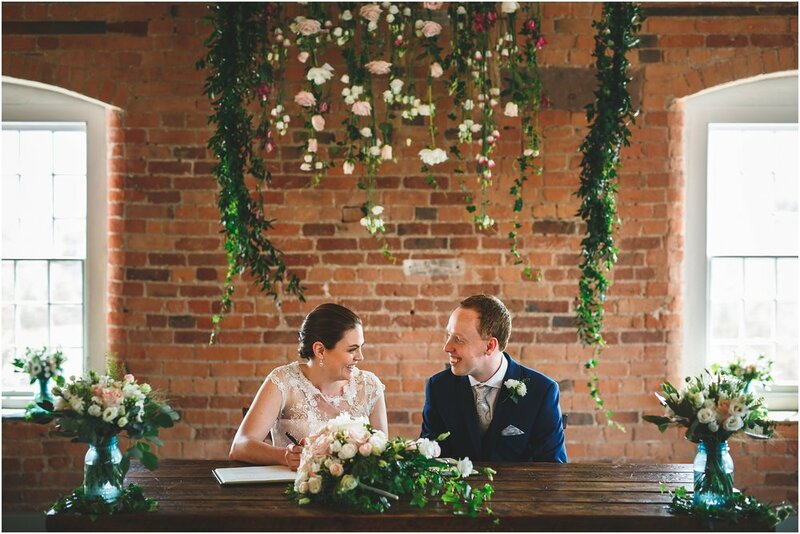 We initially met with Emma and her father at our Matlock branch to discuss the look and feel they wanted to achieve for their Wedding flowers at Callow Hall, Ashbourne, Derbyshire. Coincidentally, Emma and her father live in Hulland Ward which is where our new exclusive wedding studio now is! Emma's father was very interested in the floral designs as an avid gardener, we visited his garden a couple of times before the big day and it is breathtaking. Some of the flowers and foliage were grown and used especially for the Wedding, including exquisite garden roses and hydrangeas. Callow Hall and marquee was decorated with an array of beautiful flowers and plants and included pink Roses, blue Hydrangeas, white Stocks, Blue Delphiniums, cream Peonies, Lavender, cream Hydrangeas and Eucalyptus. The cake was designed by a family friend and was decorated with fresh flowers to compliment. We were pleased to see that our friends at Dennisson classic cars were also involved in Emma and Will's big day. The stunning images are by Suffolk based James Davidson Photography and we hope you enjoy perusing them as much as we did.